Little known or understood by the average American is his prodigious use -- and waste -- of all forms of energy. So wasteful have Americans been that we now find ourselves on the brink of energy disaster. Concern for the environment and the energy crisis has caused residents of Boise, Idaho, and others to wonder: what happened to our railroads, and in particular, our passenger trains? 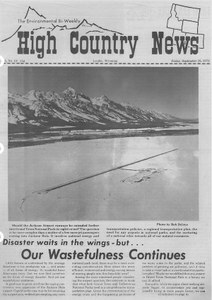 HCN author Bruce Hamilton recalls testifying against the proposed Grand Teton Jetport at a hearing in Jackson, Wyo.